Ask Gary: Why would the Rays throw away their power? The Rays decision to designate C.J. Cron for assignment -- with his projected $5.2 million salary -- was a move only their accountants would cheer. If Matt Duffy is traded as is rumored, the team will field an all major league minimum salary infield and designated hitter. Is there any justification to cut a guy who led your team in home runs and RBI the prior year and risk getting NOTHING in return? Where is the logic for paying Gomez $4 million last year to be an overrated, well-past-his-prime waste of money but not paying a young, productive, improving player like Cron $5 million in 2019? At least get something in return if you don't want him on the roster. The payroll is so low already the small market argument doesn't fit this situation. Larry, this move only makes sense to me if the Rays have a corresponding move in mind, such as getting Josh Donaldson or Nelson Cruz. Otherwise, the Rays have just given their only true power bat away for zilch. Not a bit player coming off an injury. Not a minor leaguer. Not a used fungo bat. Zilch. The Rays were 27th in the majors last season with 150 homes. Cron had 30 of them. I know, I know. If you follow the Rays, you are used to seeing quality players go over the size of their paychecks. And while the projected $5 million or so that Cron was going to make after arbitration isn't a lot for most teams, it would still make him the second-highest paid player on the team. That's a lot for a guy who figured to platoon at designated hitter this year. I thought it was the end for Cron when the team decided to bring back Ji-Man Choi (for now). The thing is, Cron is mainly going to help a team with the long-ball. He isn't a great defensive player, and he can't pinch run, and he isn't versatile. He has streaky power (most power hitters do). So I can understand the Rays not seeing him as a key piece of the future. But, I repeat, the team needs to add the power they have lost. As you know, there are only so many roster spots, and the more prospects the team falls in love with means the more vets who aren't counted as the core will be ushered toward the exit. I suspect that the Rays didn't think nearly as much of Cron as you or I did. Evidently, the rest of the majors wasn't that crazy about him either; a DFA tag usually comes as a team has exhausted its efforts to trade someone. Working for the Rays here is the decision to do the same thing with Logan Morrison last year. Working against the Rays is the decision to do the same thing with Corey Dickerson. Dickerson had a great year. Morrison was another guy in a cap. There is lots of crazy talk going around now about signing Bryce Harper and Manny Machado to 10-year (or longer) contracts worth $300 million or more. Those 283 seasons include a player age-range of 23 to 41, with 83% of them occurring during the age 28 to age 36 years. Not surprisingly, the average number of games played declines steadily as the players grow older, as shown here. The age 39 data point anomaly is because there was only one season by a player at that age - Alex Rodriguez who played in 151 games. So, over the course of these long-term contracts, as players age and/or wear out, they play in fewer games and are less productive, yet are paid more. It is all quite backwards. One-year contracts, or at least drastically shorter contracts are definitely in order. Players should earn the most during their most productive years. My thoughts are that I would hate to be in a serious argument with you. Your research is staggering, and your arguments are flawless. Most of us would simply say "gee, isn't it odd that players get into big money as their bodies are wearing down?" But you cross the t's and dot the i's. There really isn't a lot to add. A lot of it, I think, are teams just trying to lower the chances of losing. So they overpay for a few moments, and they try not to look as bodies break down. Take David Price, whose best year was when he was 26 (and making $4.3 million a year). In the six years since then, he's made more than $133 million. But he's never won 20 again, and he's never won another Cy Young Award. The examples are endless. Teams pay players ridiculous amounts of money to pay them long past their days of being useful. Do you think that USF will ever have a large, passionate fan base? Probably not, Jim. They can draw more, and the right kind of season can increase the passion. But a few things are working against the Bulls, to be honest. One: It's still largely a commuter school. That's tough to overcome. Two: It shares a home with an NFL team. Most of the rabid fan bases are in places like Tuscaloosa and Notre Dame and LSU. The shadow of an NFL team isn't covering them. Three: They don't have an on-campus stadium. I know that the Bulls look on the bright side of things and talk about the advantages of playing in an NFL stadium. But for a freshman student, it can be a problem to get to Raymond James. Four: There is a distinct lack for history for the Bulls. No one's grandfather watched them play when he was young. You can feel the history at Notre Dame or Michigan or Alabama. Not so much at USF. Five: There are divergent interests in Tampa. A lot of people love the Florida Gators. A lot love the FSU Seminoles. TV is always a competitor, because it seems like every game is on television. Six: The competition hurts. Tulane? ECU? That isn't exactly like playing Tennessee or Georgia, is it? It's hard to blame the Bulls that a bigger conference hasn't called, but it is part of the problem. Seven: There is a history of in-season collapses with the program. I think it's left fans with a feeling of distrust of the finish to a season. Granted, part of that impression is because of the rapid growth of the program -- which built up expectations to unrealistic levels. Eight: The Bulls don't play a particularly exciting brand of football. Early in the game against UCF, they ran the ball inside the tackles on four straight plays. Yawn. A lot of teams look a lot more creative than USF. It'll take years for USF to build up a decent following. Again, it can get better. But it's miles from being the big-time. The state of Florida has some high-profile college coaches. Which one do you think is the closest to leaving or to getting fired? That's two different questions, isn't it Paul? As far as getting fired, I think it's a little early in the process to replace FSU's Willie Taggart, Dan Mullen or Josh Heupel. They've only been at work a matter of months. FSU isn't going to pay the price to replace Taggert. Florida is happy with Mullen, who had progress this season. Heupel is undefeated, so everyone loves him. Strong had decent success for his first year and a half. I don't think he's in danger of getting fired yet. FIU had a great year under Butch Davis. And FAU isn't going to can Lane Kiffin. So who does that leave? How about Miami's Mark Richt? Already, there is unrest. The guy stubbornly won't hire an offensive coordinator, and he hasn't landed a top flight quarterback yet. It won't happen this season, but if UM isn't better next year, I think the voices might rise. As far as leaving, you have to think that Heupel will get a big time offer soon. Does he hold out for Oklahoma, or does he pursue a Power 5 conference job? And you get the feeling that Kiffin always has feelers out for his next job. Getting fired? I'd bet on Richt. Getting a promotion? Let's go with Heupel. How long do you think it will be before the Glazer boys realize that they aren't very good at hiring coaches? The scary thing, Jim? They were decent at it for a while. They hired Tony Dungy and made the trade for Jon Gruden, and everything was going swimmingly for a while. But Raheem Morris? Greg Schiano? Lovie Smith? Dirk Koetter? After a while, it isn't the guys you're hiring, it's the guys who are doing the hiring. Right? One of the reasons I thought the team needed to bring Koetter back this year was this: If the Bucs ever do hire the right guy, he's going to need more than two years to turn this franchise around. Look, most NFL owners aren't football experts. There is nothing about having a silly amount of money that makes you able to judge talent. But the NFL owners who aren't adept at their job usually hire someone solid to run their organization. You know what's different now from the Dungy days? Then, you had someone smart -- and patient -- in charge of the franchise. You had reason and logic and analysis. These days, you don't. And it's becoming more and more apparent that the Glazers aren't victims here. They're lacking, too. Let's say you're a MLB franchise and you've set aside money for this free agent class. Make a case for signing Manny Machado, and a case against it. Peter, let's start with the fact that Machado is a fantastic talent. That obviously makes for an argument that you should bring him back, even at a richer-than-Midas contract. As Scott so well put it above, most of those contracts just don't work out. You're giving one guy the salary of 3-4 guys, and it chances the atmosphere of your clubhouse. The arguments for: He's a star in a star town. He's had more than 30 home runs four straight seasons. That's hard to replace. He's just 26 years old, which is younger than most players when the hit the open market. So you wouldn't be paying a broken down guy. And some would argue that you made that decision when you sent five prospects for him. Did you do that for half of a season? The arguments against: Machado isn't the only excellent a player the Dodgers have, and you'd have to be concerned with the ripple affect with Justin Turner and Corey Belllinger. If you've followed Andrew Friedman, throwing silly money at a single player isn't exactly his style. It's easy for the rest of us, isn't it, Pete. We see a guy who is more talented than the next guy, and we think the team should sign him. It isn't our money. It isn't our clubhouse. Having him is better than not having him, right. But if you weigh everything, I don't think Machado is a slam dunk. The Dodgers are a pretty good team without him. There was an article in Forbes last October that suggested the Dodgers should bench Machado because of his lacksadaisical play. There were a couple of incidents cited where Machado. hadn't hustled. I'm an old codger (talking about the old Dodgers), but that bothers me. There is nothing about a heaping amount of money that's going to make a player try harder than a very decent amount of money didn't. That, too, can fill a clubhouse with conversation and spoil chemistry. In another interview, with Ken Rosenthal, Machado says this: "Obviously I'm not going to change, I'm not the type of player that's going to be 'Johnny Hustle,' and run down the line and slide to first base and … you know, whatever can happen. That's just not my personality, that's not my cup of tea, that's not who I am." To me, that's the tie-breaker. I shake my head at the talent, and I know I won't be able to replace it. But I'm not going to throw $300 million at a guy who doesn't hustle. I could be wrong but I think only Dickerson was DFA’d last year and Morrison left as a free agent. Regardless, nobody missed Morrison. He needed to go. Dickerson had a good year as you said and there is no reason Cron won’t do the same for another team next year. The thing that irritates me the most about the Rays is how they undervalue offense as an organization. To be a legitimate contender you need to have a balanced team with good offensive players mixed in with the role players with the good gloves who can play multiple positions that management values so much. Adding 1 “bat” is not going to push this team over the top. Multiple bast are needed to be a playoff team that can contend. And if the Rays think they can afford a “bat” who is better than the guy they just gave away they are kidding themselves. They are overpaying KK for his great glove and it’s killing their chance to build a balanced team. I get that $5 Mil is a high salary for the Rays but their overall payroll is so low at this point they can afford it. But again if you don’t want the guy on your roster trade him for something. 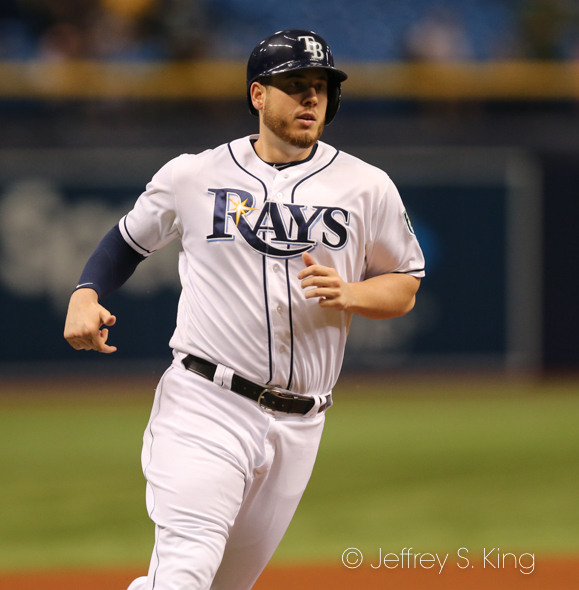 It’s inexcusable to just give away Cron and the Rays must be held accountable. They are better than that. Larry, I’m sure the team tried to trade Cron. If not, they’re dumber than a box of rocks. Besides, what does the front office have to do all day but make phone calls about a trade. Nevertheless, I would have thought they could get something for a guy who hit 30 homers. But maybe by letting their intentions known, they drained the value from him. Everyone knew that the team wasn’t going to keep him. Personally, I would have kept Cron ahead of Choi. I do agree that the Rays undervalue offense. The reason I used the Morrison comparison was not the way they left — that’s a technicality. Both were here, and the team made the decison to let them both go after almost identical seasons. In 2017, Morrison had 512 at bats, hit 38 homers, drove in 85 runs and hit .246. In 2018, Cron had 501 at bats, hit 30 homers, drove in 74 and hit .253. Not much difference there. Still, the Rays currently have a roster squeeze, and some talented players are going to have to move for some others. The team simply didn’t value Cron the way we did. We’ll see how it works out, though. Cron will get invited to a team that wants him, and we’ll see how his next season goes. That’s the beauty of baseball, isn’t it?